The 1st ALFA Symposium was held on December 9th, 2017, in the Auditorium of the Department of Chemistry, School of Science, The University of Tokyo (Hongo Campus). A total of 80 participants attended the event from across Japan to discuss the plan to establish the Attosecond Laser Facility (ALFA). Introductory speeches were made by President Makoto Gonokami (President of the University of Tokyo), Mr. Takashi Nishiyama (Director of the Office of Quantum Science and Technology, Ministry of Education, Culture, Sports, Science and Technology (MEXT)), Prof. Yasuhiko Arakawa (Institute of Industrial Science, The University of Tokyo), and Prof. Shin-ichi Ohkoshi (Vice-Dean, School of Science, The University of Tokyo). 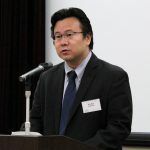 Afterwards, Professor Kaoru Yamanouchi (School of Science, The University of Tokyo), gave a talk outlining the plan for ALFA. This was followed by a series of short presentations by around 40 attendees, proposing their ideas and expectations for ALFA. Active discussions took place, and continued through to the reception, which was held following the symposium. 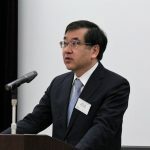 In his introductory speech, President Gonokami discussed the importance of cutting-edge optical science and technology to Society 5.0, Japan’s structural transformation plan. He expressed his hope for the implementation of ALFA to create innovation within Japan’s optical science community. He also maintained that the University of Tokyo strongly supported the ALFA project. Next, Mr. Nishiyama discussed the progress of MEXT’s Photon Frontier Network Program. He also summarized MEXT’s Quantum Science and Technology Committee’s New Quantum Light and Technology Promotion Strategy. Based on these activities, in August 2017, MEXT established Project Q-LEAP, a new quantum science and technology program, which was included in the 2018 annual budget estimation. Meanwhile, the Academic Subcommittee of the Council for Science and Technology successfully nominated ALFA as one of seven priority projects adopted into MEXT’s 2017 Roadmap of Top-Level Large-Scale Research Projects. Mr. Nishiyama also stated that Japan has fostered a talented workforce with outstanding research results, and has developed a strong network with a cooperative system in which the public and private sectors have collaborated to produce results which are expected to contribute towards solving economic and social problems. 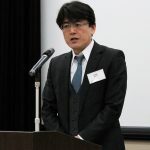 In his speech that followed, Prof. Arakawa reflected on a statement that had been given ten years prior by Science Council Japan on strengthening the optical sciences. In line with this statement, Professor Yamanouchi oversaw the publication of the book ‘Frontiers in Optical Science’. At that time, Prof. Yamanouchi alongside Dr. Katsumi Midorikawa (Director of RIKEN Center for Advanced Photonics), and Dr. Tetsuya Ishikawa (Director of RIKEN Spring-8), had proposed the idea of developing a light source concept, an archetype for the ALFA project. Prof. Arakawa also stated that due to the recent development of laser facilities in Europe (Extreme Light Infrastructure project) and the plan to establish a laser facility in China (Chinese Academy of Sciences), that this was the last chance for the ALFA project to be realized. It is expected to be established with an all-Japan framework, with users from nationwide. Lastly, representing the School of Science, Prof. Ohkoshi discussed his expectations for ALFA. His hope is for young researchers to be able to benefit from the facility, so that it will help to inspire and advance the work of future generations. 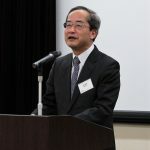 Following the introductory speeches, Prof. Yamanouchi gave a talk outlining some of the important steps that have been taken to support the ALFA project so far. This included the successful adoption of ALFA into Science Council Japan’s Masterplan and MEXT’s Roadmap of Top-Level Large-Scale Research Projects in both 2014 and 2017. Prof. Yamanouchi emphasized that the promotion of ALFA was a priority. He also described the plan to install four types of laser beamlines at ALFA: a general-use beamline, a high-repetition beamline, a high-intensity beamline and a next-generation beamline. As well as being a state-of-the-art light source facility, ALFA aims to be a user-friendly facility with attosecond pulse beams ready for use at all times. Prof. Yamanouchi stated that the plans for ALFA would continue to be developed, based upon the opinions and ideas of the symposium attendants. Afterwards, in accordance with the program, approximately 40 attendants gave presentations expressing their expectations and desires for ALFA. At the reception which followed, open discussion took place, and a consensus was met to work together in joint cooperation towards the realization of ALFA.